If you’re looking to introduce an organic element into your baby’s nursery, but want to step away from natural timber than we have the perfect alternative. Beaneasy has created baby furniture that is safe, uniquely designed and available in a great range of bright colours. Challenging our preconceived notions of organic, Beaneasy focuses on form rather than material to make a cot and dresser in the organic shape of a mother’s womb or a bean and a cabinet in the shape of an apple heart. Round soft shapes, warm happy contemporary colors, timeless design and superior quality, Beaneasy is 100 per cent Dutch, from design to production, and stands for durable products that last from generation to generation. We first introduced you to Beaneasy back in 2010 and while the range hasn’t expanded per se, there have been some improvements and modifications that make the functionality even more practical so here is a little refresher of a brand we love. The Beaneasy cot, Dream, has always been a fun and quirky shape to make a statement in the nursery and now it has the unique option of slanted mattress positions to help babies suffering from reflux. The sides in this new version are made from high quality wood slats on linen for a more refined and durable finish. 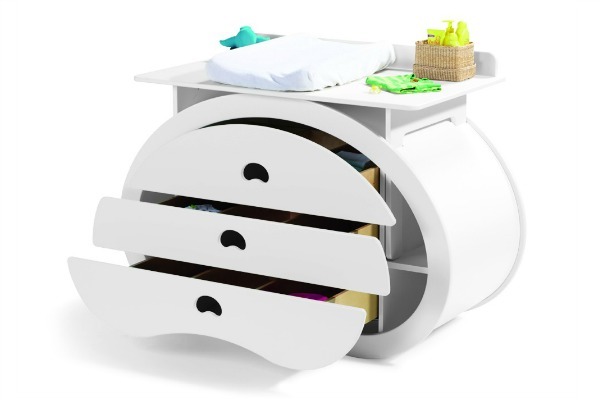 The Hug dresser has the same rounded bean shape with spacious drawers and a nursing deck, but now that nursing deck is adjustable and removable. When you no longer need a place to change and dress baby, simply lift it out and use it as a safe playing table. Like the Dream, it now has wood-on-linen sides. Hide is the dresser that rounds off this suite of three gorgeous nursery pieces. The five shelves and hanging bar provide ample storage and the apple design is just adorable. The entire range is available in five accent colours; Milk, Sand, Water, Apple and Heart. The Dream (€1575) and Hug (€1695) have a white frame with coloured core while the Hide (€1645) has a coloured frame and white core. Personalised colours to suit the theme of your nursery are available upon request. Based in the Netherlands, Beaneasy delivers worldwide in an easy-to-install flatpack. For shipping rates and further details visit the Beaneasy shop online.